finds it well worth a visit or two. Those of you who have been to the likes of Barcelona, Paris, Rome and Prague, don’t laugh – Bratislava is one of my favourite European cities. I am not the only one to think this way. After I took my father on an 80th birthday trip (his, not mine!) to Vienna, Budapest and parts of Romania, I asked him what his favourite stop was. The answer – Bratislava. Sure, the Slovak Republic capital’s attractions are rather more modest compared with Europe’s big glamour cities, but the truth is sometimes the top drawcards are hard work for tourists to explore – you have to jostle with thousands of other sightseers, navigate complex transport systems, unfold maps to get your bearings, constantly watch your back, and so on. They’re exciting, for sure, but often mentally exhausting. 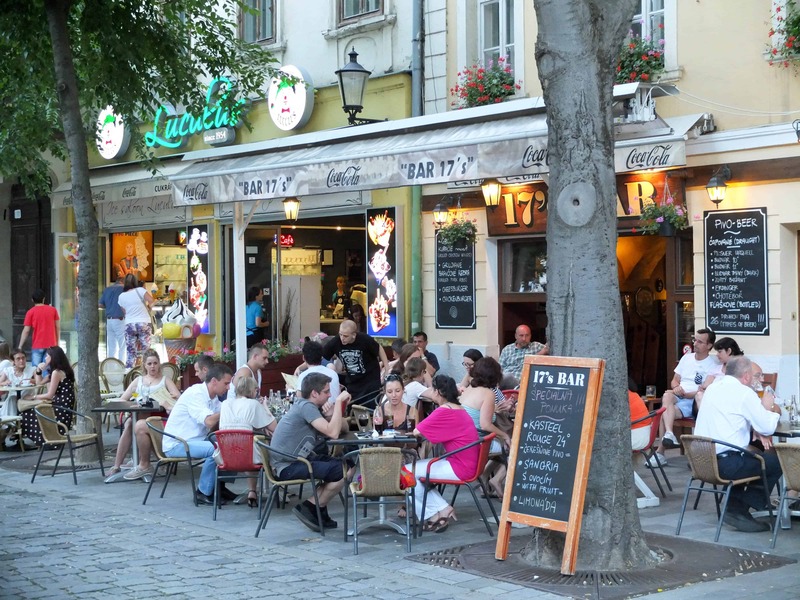 Bratislava, in contrast, is a real pleasure to experience – it’s calm, compact, and very pedestrian-friendly, a place where you just amble around at leisure and poke your nose in at whatever takes your fancy. Its attractions aren’t that modest either. People forget that for 248 years, after the Ottomans had occupied much of south-eastern Europe, Bratislava served as the capital of the Kingdom of Hungary (under Habsburg rule, the city was better known by its German name, Pressburg). But because of its proximity to Vienna, which is just 56 kilometres west, as the crow flies, it tends to get overlooked as a tourist destination. Which is fine by me – I like places that slip under other people’s radar. Bratislava Castle has the best views. 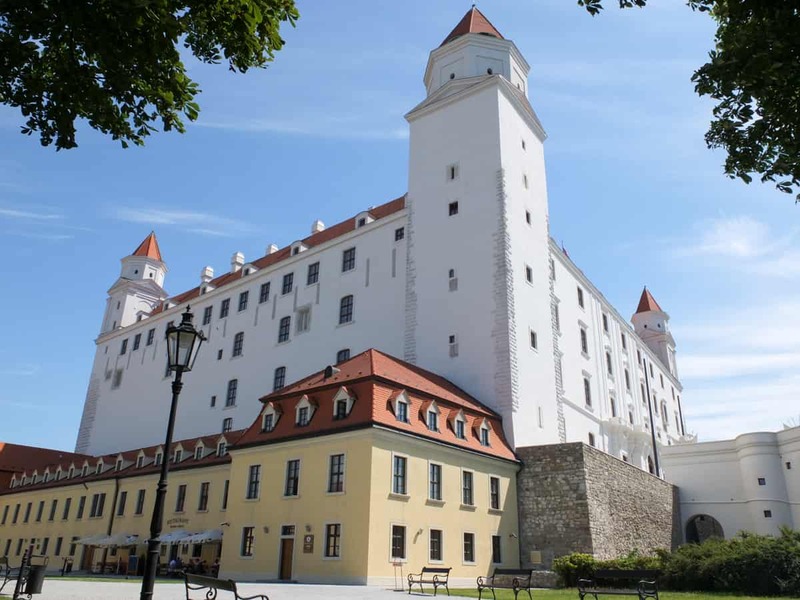 The emblem of the city, Bratislava Castle, makes a good starting point for any visit – it’s up on the highest hill overlooking the historic old town and the Danube river. It was the favoured residence of the Habsburg Queen Maria Theresa. Unfortunately, though, it burned down in 1811, and was rebuilt only in the 1950s, so if you are expecting it to be like the Habsburgs’ grand Schönbrunn Palace in Vienna, you will be disappointed. But the castle has great views, museum exhibitions, and cafés and restaurants on hillside terraces that are the perfect setting for a long lunch. If the walk up the hill is too steep for your lungs and legs, take the tourist mini-train. From here, you will be glad to know the rest of the obligatory sightseeing is all downhill. St Martin’s Cathedral, at the foot of the castle hill, is an important shrine in Habsburg and Hungarian history – no less than 19 coronations were held here, including those of kings Leopold I and II, Charles III, Ferdinand II, IV and V, and Queen Marie Theresa. In the tower of the Neo-Gothic cathedral, the ecclesiastical treasures are on display, and there are catacombs for the adventurous to explore. Bratislava is thus known as the Coronation City, and hosts coronation festivals and re-enactments every summer. From the Cathedral it is a short walk to the centre of the historic old town, which features two attractive interlinked squares (Hlavne namestie and Frantiskanske namestie), around which are dotted some of the most important historic buildings, such as the Old Town Hall and the Primate’s Palace. The latter was originally built for the Primate of Hungary, and is the city’s finest Neo-Classical building (Napoleon and Francis I signed a peace treaty here after the Battle of Austerlitz). The palace is now used by the Mayor, but its royal portrait and tapestry galleries are open to the public. The colourful Old Town Hall building has a viewing tower and houses the City Museum. The two squares are home to inviting cafes and restaurants, while nestled under the trees in Frantiskanske namestie are stalls selling souvenirs. Closer to the river is another pleasant square (well, it’s more of a long, narrow rectangle), Hviezdoslavovo namestie, which is the focus of the night life – the state national theatre and concert hall overlook it (as does the Radisson Blu Carlton Hotel), and there is a wide choice of restaurants (see picture at top). Venturska Michalska with Saint Michael’s Gate in the background. On the northern fringe of the old town is Saint Michael’s Gate, the only surviving original gateway to the city. Its Gothic tower (the Baroque cupola was a much later addition) it has a viewing terrace with great panoramas of the city, and it houses the Museum of Weapons. The street leading up to it, Venturska Michalska, also has great restaurants serving tradition Czech and Slovak food, not to mention the famous local beers. 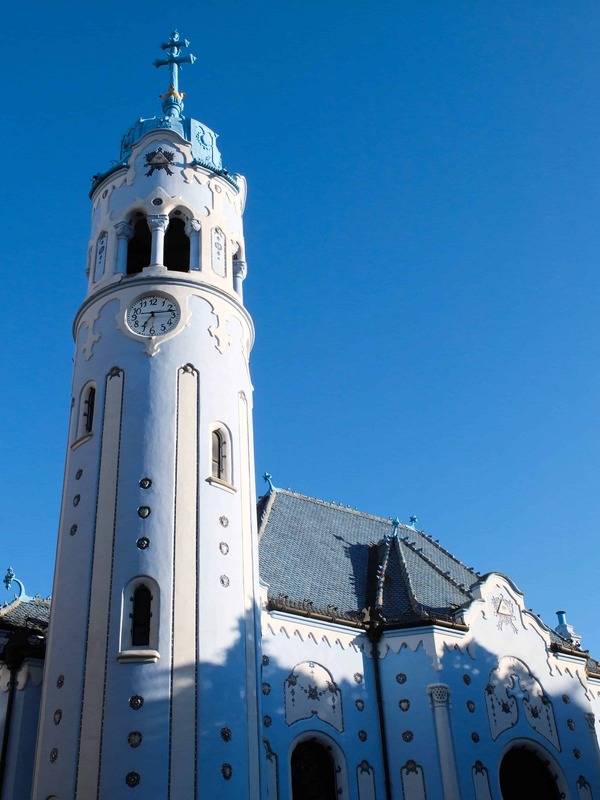 Another sight not to be missed is the art nouveau Church of Saint Elizabeth, commonly known as the Blue Church – it is one of the most picturesque little churches you will ever see. It is in a quiet little street, Bazrucova ulica, on the eastern fringe of the old town. Blue is the colour at the Church of Saint Elizabeth. Outside of the old town, there have been some dramatic changes to the city, which is at last waking up to the tourism potential of the Danube riverside. 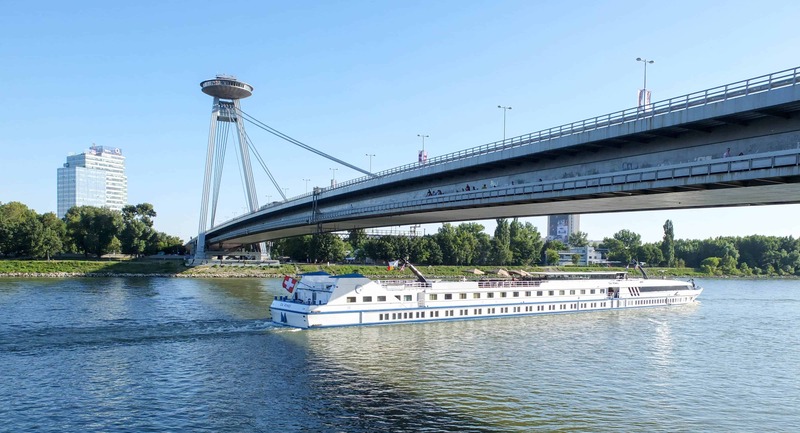 In 2010 a massive, modern waterfront complex opened that included trendy riverfront restaurants and promenades, a new national theatre, the Eurovea shopping centre, and the Sheraton Bratislava Hotel. The southern bank of the city is much more residential, but there is one attraction that is definitely worth crossing the river for – the UFO viewing tower and restaurant, suspended in mid-air 90-odd metres above the Novy Most (New Bridge). It’s the place to go to watch the sun set over the castle and old city. The UFO restaurant hovers over the Danube. 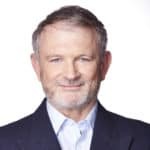 Bernard O’Shea visited Bratislava twice, once at his own expense, the other as a partial guest of the Slovak Tourist Board and the Sheraton Hotel Bratislava. More information: slovakia.travel and visitbratislava.com. Photos © Bernard O’Shea.